Anybody up for a trek this weekend to Raireshwar – Kinjalgarh? And hence this ‘bro’ decided to find out about travel things that are about to happen and post about it. Google searches didn’t help much. Our friends at goeventz portal did. I did stumble across this upcoming trek to Raireshwar – Kinjalgarh, ‘about to happen’ this weekend – September 24th 2016. But where the eff is Rair..whatever is that you ask? My turn to ask questions first. Are you in Mumbai or Pune? Do you love traveling around? Do you brood about the last few days monsoons and the associated greenery of the western ghats is going to last, and do you want to do something about it? If yes, then don’t worry about where exactly Raireshwar- Kinjalgarh is. Give yourself a break and just join a bunch of mavericks ready to trek up to a temple on a hill in Pune where the great Shivaji had cut his little finger and dripped his blood over the Shivling! Okay, for the people who get a high reading about places before going there, here’s your dope. Raireshwar is situated in Bhor Taluka near Pune, Maharashtra. Raireshwar has a temple, very old and of stone structure, re-constructed in 18th century. Chhatrapati Shivaji Maharaj took the oath of Hindavi Swarajya in this temple at the age of 16 in 1645. Kenjalgad or Ghera Khelanja Fort, 4,269 feet above sea level, is situated on the Mandhardev spur of the Mahadev range eleven miles north-west of Wai. 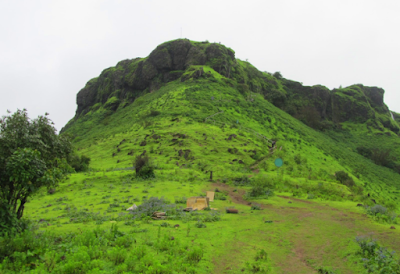 The fort is situated on the ridge which separates Pune and Satara districts. Both the Krishna and Neera rivers are visible from the Ghera Khelanja fort. Bhor with its surrounding villages and Wai with its surrounding villages are also visible clearly. During the time of Maratha Empire the fort successfully performed the role of a watch guard. Enough about the place, let’s talk about the itinerary. 2. Departure from Pune by 06.00 am. 3. In route Halt for breakfast by 08.00 am. 4. Leave towards Raireshwar & Kenjalgad Fort 8.30a.m. 6. Reach base village & immediately start a trek towards Raireshwar. Toilet Facility is not available in a base village & throughout the Trek. 10.00 a.m.
7. Start trek towards Raireshwar 12.00 pm.Exploring Fort With Detail Information. 11. Reach Kenjalgad. Explore the Fort. You will get best Photos for Photography. 04.00 p.m.
12. Start a return trek towards base Village.04.45 p.m.
13. Reach Base Village. Evening Tea. 06.00 p.m.
14. Start a return journey with sweet memories. En-route some hidden place, if time permits. 15. Return to Pune by 8.30pm. Happy trekking, and don’t forget to let us know your experience in the comments section. If we like it, we could feature it in our ‘aS-featured’ section! Information Credits: Goeventz (http://goo.gl/7ftk1g) - an online portal promising a 'Better you Everyday'. Do check them out, you wouldn't be disappointed.